This jar with wrists is ideal to serve several types of drinks or desserts... from cocktail to different juices including flavoured water, smoothies, detox water or iced tea. 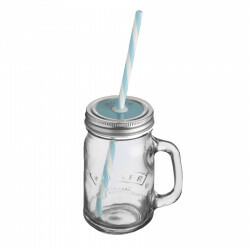 Sold with lid and straw. Choice between red and blue colours. Don't put very hot/boiling water. Discover our new glass drink dispensers from England! John Kilner created Kilner in 1842 in Yorkshire England. He started with glass containers and glass bottles to invent later the famous Kilner jar. In 1900, his invention was revolutionary, his jars are known to preserve ingredients in glass. Kilner knew how to adapt and learn from his multiples demandes. 175 years later, Kilner products are always appreciated for their hight quality, nice shapes and resistance. Le Comptoir Irlandais has selected two drink dispensers, perfect for barbecues and garden parties. Drink dispensers are often used to distribute detox drinks, ice teas or cocktails. They follow the "homemade" trend which limit wastage and pushes to consume organic ingredients.